History: The Historic Veale Ranch near Aledo has been a carefully managed, operating cattle ranch for 5 generations of the Veale family since 1935. Once part of the James Corn Ranch, which encompassed about 55,000 acres in the late 1800s, this ranch was originally purchased by Monroe Veale and his mother Ida Ward Veale. The heirs are descendants of families that settled this area and in Stephens County. To this day they continue the long legacy of proper and conservative range management, preservation of a deep rooted history in Texas ranching, and a remarkable level of care and compassion for the land as some of Texas finest ranch stewards. Location: The proximity of the Veale Ranch in Aledo is unmatched. It is South of I-20, about halfway between Weatherford and Fort Worth. The ranch gate is 11 miles from downtown Fort Worth, or a short 15-minute drive. The ranch has access to paved road on the North by Aledo Road, on the West by FM 1187, and the East by Chapin School Road, RM 2871. Minerals: 1/16 of the royalties and mineral estate is being offered for sale with an acceptable contract. The Barnett Shale natural gas formation continues to influence the market in areas to the Northwest and Southwest of Fort Worth, and the ranch is in the heart of the Barnett Shale gas play. Approximately one half of the ranch is held by production, and the Eastern 2,000+/- acres with views of downtown are un-leased. There are 20 operating gas wells on the ranch, and the operator is Devon Energy. The surface use agreement is favorable to the ranch and surface owner, whose consent is required for all future well site locations. Water: Full groundwater rights convey with this sale. There are 14 water wells on the ranch: 8 wells have submersible pumps that produce from the Paluxy formation, 3 wells have windmills that pump from the Paluxy formation, and the remaining 3 wells produce from the Trinity formation with submersible pumps. The ranch gets an average of 30 35 of rain per year. There are four main stock tanks and over 3 miles of Dutch Branch Creek on the ranch. This beautiful creek is usually running, with limestone bottoms and scenic bluffs, and it drains into Lake Benbrook. Soils: The soils on the ranch consist of mostly clay loam, including associations of Purves Clay, Aledo-Bolar Complex, and Aledo Gravelly Clay. The gently sloping flat hills feature these thin soils over hard layers of resistant limestone, the underlying layers of which are often exposed to form escarpments that produce the scenic topography typical for the area. Dutch Branch Creek also offers prime fossil hunting, and fossils are commonly found throughout the property. Topography: The ranch has gently sloping to level topography with long, rolling views. A majority of the subject property has an average slope of two percent, with some portions being around nineteen percent. The highest point of the site is at approximately 982 ft. and the lowest point of the site is at approximately 800 ft. Range and Carrying Capacity: The Veale Ranch is located on the Eastern edge of the Cross Timbers and Prairie ecoregion of Texas, and is mostly prairieland. It has consistently been a very productive ranch with mostly native grassland species of little bluestem, Indiangrass, and thick big bluestem. It has historically been able to comfortably carry about 210 220 mother cows, as primarily a cow-calf operation, supplemented with yearlings. The familys dedication to conservative management, supplemented with herd rotation of cows and yearlings, has preserved sturdy, healthy range conditions. Currently the property is stocked with Brangus cows, bred to Hereford and Angus bulls. The current cattle inventory is available for sale with a separate contract. Rail: The Union Pacific rail that passes through Aledo and Dallas / Fort Worth begins in Sierra Blanca, on a far most part of West Texas, and then travels through Sweetwater, Abilene and Weatherford before reaching the Fort Worth area. The Northern boundary of Iona Road is named after this area railroad switch, Iona. The railroad moves a diversified mix of freight cars that can hold agricultural products, automotive, chemicals, coal, and industrial products. At this railroad crossing (ID 839211T), which is near Aledo and the border of Tarrant County, the estimated number of daily train movements shows a schedule of 10 trains between the hours of 6am to 6pm, and 10 trains from 6pm to 6am. A rail spur can be added to the Union Pacific rail, and the time required for such a project largely depends on the scale of the project. Estimated construction time for a spur on the Union Pacific rail averages between 10 and 12 months, depending on the addition of a railroad turnout or not. Improvements: Significant improvements include two ranch homes with luxury features. One is 8,000 sq ft with a horse barn, stalls, equipment shed and lighted riding arena. The other is 3,500 sq ft and beautifully landscaped with mature trees, rock patio, outdoor fireplace and a luxury pool highlighted with waterfalls. The Historic Ranch Headquarters includes two of the four other residences complete with cattle working pens and barns. Complete details on all improvements are listed further below. Wildlife: The Veale Ranch also has abundant wildlife with plenty of whitetailed-deer, Rio Grande turkeys, migratory birds, coyotes, foxes, and a healthy population of bobwhite quail that thrive on the property. The stock tanks have bass, bream, and catfish. Equipment: Ranch equipment, tractors, trucks, and rolling stock are available with a separate contract. Future Development: The Veale Ranch is a 3,790-acre tract of land located Southwest of the intersection of Aledo Road and RM 2871 in the City of Fort Worths Extraterritorial Jurisdiction (ETJ). It is comprised of 24 significant parcels as identified in the Veale Ranch Parcel Table, and with a future land capacity, after development, of over 33,000 residents. Existing Conditions: The site is currently undeveloped. A few private residences and multiple gas wells exist onsite. Multiple gas easements and gas lines exist onsite as well. In the City of Fort Worth, a 300-foot setback is required from a gas well for any habitable structure. Development Standards: Since the subject property lies within the City of Fort Worth ETJ, the property will be subject to the City of Fort Worths engineering and development standards. In order to start the development process, a Pre-Development Conference would need to be scheduled with the City to discuss the proposed development and initial steps. Zoning: Since the subject property is currently within the City of Fort Worth ETJ, it is not zoned. When the subject property is annexed by the City of Fort Worth, the land will automatically be zoned as Agricultural. A zoning change will be required depending on the proposed use. Land Use Plan: According to the City of Fort Worth Projected Land Use Plan, Veale Ranch is within the Far Southwest Sector. The projected uses within the subject property include a mixture of rural residential, private park, public park, neighborhood commercial, and agricultural. These land uses do not constitute zoning regulations, but they are a guideline for what the City would like to see developed. Platting: The City of Fort Worth will require three different stages of plats for the proposed development: Concept Plat, Preliminary Plat, and Final Plat. The Concept Plat will be prepared for the overall development and will provide information such as proposed use, phasing, and other information that will help with the over-all planning of the entire development. The Preliminary Plat will be prepared to give a more detailed description of the proposed lots, thoroughfares, and easements. Water, wastewater, stormwater, and traffic studies are required at this phase. A Final Plat shall be provided for each parcel before a building permit is granted. Thoroughfare: Access to the subject property will be provided mainly by Aledo Rd., which is currently a two-lane asphalt road along the Northern boundary of the subject property. The City of Fort Worths Master Thoroughfare Plan defines Aledo Rd. as a Neighborhood Connector with a 110-foot right-of-way. According to the City of Fort Worths Master Thoroughfare Plan, additional thoroughfares are proposed within the subject property. Dean Ranch, Walsh Ranch Major 1, Bear Creek, and Markum Ranch are proposed Neighborhood Connectors that may be dedicated to the City. Drainage: The subject property lies within the Lower West Fork Trinity Subbasin, the Lower Clear Fork Trinity River Watershed, Upper Clear Fork Trinity River Watershed, Dutch Branch Benbrook Lake Subwatershed, Marys Creek Subwatershed, and the Brown Branch Clear Fork Trinity River Subwatershed. Most of the site drains to Benbrook Lake located east of the property, but the southern portion of the property drains to a stream at the south boundary line. According to the FEMA FIRM Map 48439C0270K and 48367C0450E, a 100-year floodplain exists on the site but it only encompases about 200+/- acres. Water Service: Water service would be provided by the City of Fort Worth. However, multiple improvements would be necessary to provide service to the subject property. 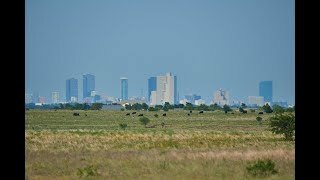 According to the study, Water Comprehensive Study for City of Fort Worth, Veale Ranch and Bella Flora, produced by Blackstone Engineering in 2012, the study states that final buildout of Veale Ranch would require extensive off-site improvements based on current conditions. However, an alternative is presented in the study as a temporary solution that would only require on-site improvements. Wastewater: Wastewater service would be provided by the City of Fort Worth, however, off-site improvements may be required. A wastewater study was performed by Pape-Dawson Engineers on April 7, 2015 for Veale Ranch and its downstream watershed to show that the existing system in Dutch Branch has sufficient capacity for the proposed Veale Ranch development. Wastewater service would need to be extended to the site from Benbrook Parkway and Dutch Branch. Extension is proposed to the Rolling V South Development, however, and if this is installed before development of Veale Ranch, the cost of offsite improvements will greatly decrease. Fees: Since the subject property is located within the Fort Worth ETJ, it is subject to Fort Worth development fees. Water and wastewater impact fees will apply and depend on the size of the water meter. No transportation impact fees apply because the subject property lies outside of the Fort Worth transportation service areas. The Historic Ranch Headquarters includes two other residences complete with cattle working pens and barns. 1,400 +/- sq ft one story frame house built in 1945. The East Home has full equestrian facilities with horse barn, stalls, equipment shed and a lighted riding arena. The remaining improvements include a 1,400 sq ft ranch house built in 2003 with 2 bedrooms and 1.5 baths, a 2,600 sq ft ranch house with 2 bedrooms and 2.5 baths, and a 120 x 40 shed with dog kennels.